Bacon + sausage = baconage. 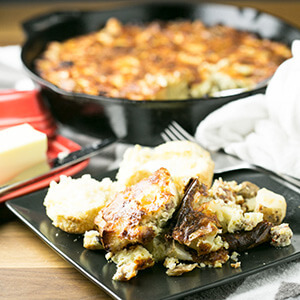 With potatoes, cheese, eggs, and baconage, baconage breakfast casserole takes your special occasion breakfast to the next level. It’s been a while since I talked about baconage. Back when every Wednesday afternoon was spent at the Main Street Farmers Market, baconage was a pretty regular occurrence around here. Since I quit working downtown, it’s a little harder to get down there, so it’s not something I keep around. A recent trip to Main Street Meats, though, resulted in a package of baconage. And a refresh of one of my favorite breakfast recipes, baconage breakfast casserole. For those of you who don’t know, bacon + sausage = baconage. Does that sound like a thing of beauty? IT IS. Baconage is great for anything you’d use regular breakfast sausage for: biscuits and gravy, breakfast tacos, and perhaps best of all, breakfast casseroles. This isn’t your standard breakfast casserole, which is usually made with bread (and lots of it). Instead, I use potatoes here and get my bread in the form of White Lily biscuits because White Lily biscuits. Of course, it does have plenty of cheese, because I’m not a hack. I baked the potatoes the night before and made my casserole right before popping it in the oven, but you could totally do everything except the baking the night before and just bake it when you get up. After all, isn’t that what makes breakfast casserole pretty much the perfect breakfast dish? You make it the night before, then the next morning you stick it in the oven. It’s perfect for a lazy Saturday…no fiddling with pans or waffle irons or dredging stations. Preheat, bake, done. Of course, there’s a pretty good chance that you don’t have a store near you that you can visit to stock up on baconage. That doesn’t mean that you can’t put baconage breakfast casserole on the table. Nay nay…you have lots of options. You could pulse 4 ounces of bacon in a food processor until it’s finely chopped then cook it with 4 ounces of breakfast sausage. You could just use sausage here instead of baconage. You could even sub in half a pound of chopped ham or cooked crumbled bacon. Really, it doesn’t matter how you make baconage breakfast casserole, it’s going to be good. Trust me. Shared on The Weekend Potluck on Served Up With Love. Preheat the oven to 350 degrees. Brown the meat in a large skillet (I used a 10" cast iron skillet). Remove to drain on paper towel. Cook onions in the fat from the meat until they begin to soften, then add the potatoes. Cook until browned. Place the potatoes in a 9-inch pie pan and spread out to cover the bottom of the pan. Cover with the cheese, then the meat. Beat the eggs with the milk. Add salt and pepper. Pour the egg mixture over the meat, cheese, and potatoes. Cover with foil and bake for 15 minutes. Remove the foil and bake until the eggs are set and the cheese is browned, another 30-40 minutes. Allow to stand for about ten minutes before serving. You can make this the night before. Complete recipe through step 4 then cover with foil and refrigerate overnight. In the morning, preheat the oven to 400 degrees. To avoid thermal shock, remove the casserole from the refrigerator at least 15-20 minutes ahead of time. Bake covered for 15 minutes, then remove the foil and bake for another 40-45 minutes. Remove from the oven and allow to sit for 10-15 minutes before serving. This Instant Pot vegetable beef soup is easy fall comfort food! Directions to make it a dump-and-go Instant Pot freezer meal and it’s great for a weeknight! You guys, fall is coming! I mean, I’ll be 100% honest – it probably won’t actually feel like full-blown fall here until December because that’s how Tennessee rolls – but in just a few weeks the calendar will say that it is fall. Fall is officially my favorite. I mean, I love spring, because spring signals that summer is just around the corner. Fall, though, really does something to me. The cool breezes, the leaves changing colors and falling off the trees, the feeling that the only thing to do on a Saturday evening is eat popcorn in front of a horror movie. For many, it’s also the Friday night lights and the roar of the crowd at a college football game. And then there’s the food. Apples and pears, caramel, tailgating snacks, warm casseroles…and soup. I eat soup year-round, how about you? I just love soup so much that I really don’t care if it’s 95˚ outside. I get it, though…some people don’t want their dinner to make them sweat even more in the summer (kudos to my AC and ceiling fans!). Vegetable beef soup will forever and ever make me think of two things: my grandmother and my elementary school cafeteria. It was one of the few foods that I ate at school, and something that I always savored when my grandmother made it. Her vegetable beef soup was always made with ground beef, not with chunks of beef. It always had potatoes, carrots, corn, peas, green beans, tomatoes…and pasta. Yep, pasta. She would throw in a handful of tiny alphabet pasta shapes, which I always thought made the soup so much fun. Alas, I could not find tiny alphabet pasta shapes, so I skipped the pasta altogether. And, of course, I made it in my Instant Pot. My Instant Pot vegetable beef soup is also a freezer meal! Lately I have loved have a few dump and go Instant Pot freezer meals in my freezer. You literally unmold the food from the container, sauté it in the Instant Pot to start the thawing process, and pressure cook it as normal. The assembly process is just as simple. You throw a few ingredients into a round freezable container, lid up, and freeze. No excuse not to make dinner on a weeknight now! This freezer meal soup took minimal effort to put together on a weeknight. Serve it with cornbread or a grilled cheese sandwich for comfort food at its finest! Shared on The Weekend Potluck on Served Up With Love and Meal Plan Monday on Southern Bite! 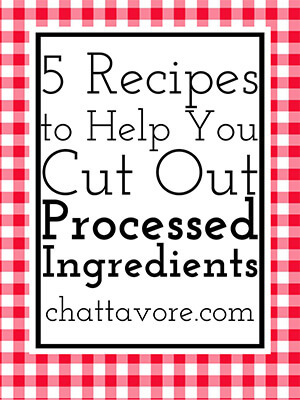 Click here to save this recipe on your Instant Pot, Soup, and Freezer Meal Pinterest boards! This super comforting vegetable beef soup can be made fresh in your Instant Pot, or you can make a dump-and-go freezer meal out of it! Either way it's easy and delicious. Brown the ground beef in the Instant Pot or a pan. If using the Better Than Bouillon, you can add it after the ground beef is cooked and stir to combine well. Dump the ground beef into a 64-ounce round freezer safe container (the one that I used was a little smaller than this and it worked but the lid was about to pop off! The store did not have bigger ones the day I bought them). Add the canned tomatoes (do not drain), carrots, onion, celery, green beans, peas, corn, and bay leaf. Add 2 cups of water (or beef broth, if not using Better Than Bouillon). Cover with the lid, add a label, and place into the freezer. To cook the soup: run warm water around the outside of the bowl to loosen the frozen soup from the container. Place the soup in the Instant Pot. Turn the sauté setting on and add a lid (I have an Instant Pot glass slow cooker lid but you could just use a regular pot lid as well). Heat the soup on sauté for 10-15 minutes, stirring occasionally, until most of the liquid has thawed. Add two more cups of water (or beef broth, if not using Better Than Bouillon) and the potatoes. Press the cancel/off button to turn off the sauté function. Cover with the Instant Pot lid and set the vent to sealing. Select the manual or pressure button. Make sure the pressure is set to high and set the time to ten minutes. Once the cook time is complete, allow the Instant Pot to depressurize naturally for ten minutes. Manually release any remaining pressure. Add salt and pepper to taste and serve immediately. To bypass the freezer step, simply add all of the ingredients to the cooked ground beef in the Instant Pot and follow the directions in step six. The cooked soup will also freeze well, but potatoes get a little mushy in the freezer. If this bothers you but you would like to freeze your leftovers, you can leave them out. This easy Chinese chicken from the cookbook 100 Days of Real Food on a Budget is so simple and delicious! Prep-ahead directions included to simplify dinnertime! I’ve been following Lisa Leake’s blog, 100 Days of Real Food, since the early days. In fact, I think that I started following her blog around the same time that I started mine, so it was one of my earliest inspirations. When Lisa released the first 100 Days of Real Food cookbook in 2014, I jumped on it. In fact, I had pre-ordered it so it would be delivered to my Kindle on the day it came out. And when her second book, 100 Days of Real Food: Fast and Fabulous, came out in 2016, I was excited to write a review about it. So, of course, when the opportunity came up to review her latest book, 100 Days of Real Food on a Budget, released on Tuesday, of course I couldn’t pass it up! After Lisa’s family completed the initial 100 Days of Real Food challenge, she heard the voices of readers who pointed out that whole, unprocessed, and organic foods were just too pricy for their tables on a day to day basis. So, she started a second challenge where for 100 days she and her family of four ate off of a grocery budget of $125/week, which she states on her website is less than the full SNAP benefit of $167/week. 100 Days of Real Food on a Budget is a book dedicated to budget friendly “real food” meals. Lisa’s books always begin with an explanation of what “real food” is (basically, whole foods and/or packaged foods with five or fewer ingredients) and tips for how to shop for a real food pantry. In this book, she also gives tips in the first chapter about minimizing waste, meal planning, and lowering your grocery bill. Each recipe includes a price breakdown showing the cost of each ingredient as well as the cost per serving. Lisa’s prices are based on Publix prices at the time that the book was written, so she didn’t go super-inexpensive with Aldi or Walmart prices but also did not shop at Whole Foods or Earth Fare, which certainly would have yielded much higher prices. Lisa’s recipes are always approachable. She doesn’t go over the top with fancy dinners that the average person couldn’t (or wouldn’t) replicate at home. She is the mother of two middle school age daughters, so her recipes are also kid-approved. Granted, her kids probably eat more vegetables than the average teens/pre-teens, but she was very candid in the early days of her blog about having a picky eater and gives lots of tips for winning them over. My favorite feature of Lisa’s books (and her blog) is always the “packed lunch” section. She gives tons of ideas for lunches that are both kid and adult pleasing and don’t involve a sandwich every day (I for one would lose my mind if I had to eat a sandwich every day!). That chapter of this book does not disappoint! The only (sort of) negative thing that I have to say about the book is that, looking at the cost per serving of some of the recipes, I think that it might still be seen as somewhat cost-prohibitive by a family on a very strict budget. I recognize, though, that this is less of a flaw of her book and more of a flaw of our food system, which sells high-calorie processed foods at a much lower premium, calorie for calorie, than fruits, vegetables, and other unprocessed foods. Still, the book delivers lower cost ways to incorporate whole foods into your diet in an accessible way that can be useful for anyone – even those on a very tight budget – to at least start moving in the direction of eating a little better. Prepping the meal ahead meant that my time from starting dinner to getting it on the table was cut at least in half. I cooked brown rice in my Instant Pot then breaded and pan-fried the chicken while it was cooking. The sauce reduced quickly and I had dinner on the table in about 40 minutes (cleaning up while I went, taking photographs, and getting a few other things done around the house while turning the chicken and stirring the sauce). This easy Chinese chicken from 100 Days of Real Food on a Budget was a delicious dinner and a great way to start my foray into meal prepping! I definitely recommend the book. Follow this link if you would like to get a copy of 100 Days of Real Food on a Budget for yourself! *I received a copy of this book to review and write about on my blog. I have followed and supported the 100 Days of Real Food blog for many years. As always, all opinions are mine and mine alone! This post contains affiliate links. This means that if you click the link and make a purchase, I will receive a small commission. This does not affect the cost to you. For more information, please see my disclosures. Thank you for supporting my blog! Click here to save this recipe to your Pinterest chicken and dinner boards! To prep ahead: in one jar, shake together the marinade ingredients. In another jar, shake together the sauce ingredients. Cover and refrigerate. Cut the chicken into cubes, place in a storage container, and refrigerate. At least fifteen minutes and up to 12 hours before you want to cook the chicken, add the marinade to the chicken. When you are ready to cook the chicken, place the whole wheat flour on a plate and roll the chicken pieces around in the flour to coat completely. Move the chicken to another plate. Heat the coconut oil in large skillet over medium heat (I used a 12-inch cast iron skillet). When shimmering, add the chicken pieces in a single layer and cook for 3-4 minutes on each side until browned. Remove to a clean plate (I did this in two batches), leaving the browned bits in the pan. Do not remove the pan from the heat. After all of the chicken is cooked, give the jar of sauce ingredients a good shake and pour into the pan that you cooked the chicken in. Stir, scraping up the browned bits from the bottom of the pan, and reduce until the sauce is thickened. Add the cooked chicken pieces to the pan and stir to coat. Serve immediately with cooked rice and your choice of vegetables. Loaded with ham, Cheddar cheese, and broccoli, this Instant Pot breakfast casserole (or strata, if you will) comes together so quickly and is a perfect one-dish meal for breakfast or brunch…but no one will judge you if you eat it for lunch or dinner, either! Breakfast Casseroles are the Best! Raise your hand if you love a one-dish breakfast?🙋🏻You guys know that I love my grandmother’s Christmas egg soufflé. When I set out to make an Instant Pot breakfast casserole, I knew that I wanted it to be even easier than that one, which is saying a lot. I decided to go with ham instead of bacon or sausage, since it doesn’t need to be precooked. Combined with sturdy bread cubes (I went with tangy sourdough), smoked Cheddar (though you could certainly use regular), broccoli, and eggs, this breakfast casserole – or strata – took about fifteen minutes to throw together after dinner. I covered the dish with foil and stuck it in the fridge overnight. This is a seriously simple “pot-in-pot” meal. Just pour a little water in the bottom of your Instant Pot, add the trivet, and set your baking dish or soufflé dish in a little sling made out of foil. A few minutes under high pressure and you have a perfectly baked egg casserole that is 100% customizable (don’t like broccoli? Leave it out! Prefer pepper Jack? Go for it! This breakfast casserole is your oyster!). Also, let’s take a quick second to address the elephant in the room: that broccoli is not pretty. I promise it was delicious and it wasn’t mushy! For real, you guys. You can have this Instant Pot breakfast casserole however you want it. And trust me…you want it! Combine the bread cubes, broccoli, ham, and 3/4 of the cheese in a large mixing bowl. Pour into an 8-cup soufflé dish or other round baking dish. In the same bowl (there is no need to wipe it out first), whisk together the eggs, milk, salt, and pepper. Pour over the bread mixture. Sprinkle with the remaining cheese. When ready to cook, pour 1 1/2 cup of water into the bottom of the Instant Pot. Place the trivet in the Instant Pot. Make a foil sling by folding two 20-inch pieces of aluminum foil into thirds to make two long strips. Place the foil strips perpendicular to each other on top of the trivet. Place the casserole dish into the Instant Pot on top of the foil sling. Fold the ends of the sling over so that they are not hanging out of the Instant Pot. Place the lid on top of the Instant Pot and make sure that the pressure release valve is set to sealing. Select the pressure cook setting and set the time for 25 minutes. When the cook time is up, turn the Instant Pot off or unplug it. Allow the Instant Pot to depressurize naturally for 10 minutes then turn the pressure release valve to venting to release the remaining pressure. Carefully use the aluminum foil sling to remove the casserole from the Instant Pot. Remove the foil and allow the casserole to stand for ten minutes before serving. Sausage and red pepper mini quiches come together so quickly and they’re so easy to make…and delicious, of course. They’re great for brunch! How do you feel about brunch? Are you a brunch person? For me, brunch = life. I mean, breakfast food is always perfect…am I right? How can you go wrong with biscuits and gravy? Bacon? Eggs? Sausage? Answer: you can’t. Breakfast foods are awesome any time of day. I mean, it’s not really universally accepted to eat spaghetti for breakfast, but it is totally universally accepted to eat pancakes for dinner. The really great thing about brunch is that most of the time brunch foods are pretty easy to whip up but when you say that something is “brunch” it becomes totally fancy and special. I mean, serve up a mimosa beside just about anything and it’s fancy, right? Easy, crowd-pleasing, and fancy? Hello! Quiche is one of my absolute favorite brunch foods. First of all, quiche is an awesome “clean out the fridge” food. Throw in a little bit of this and a little bit of that and add some eggs and you have an incredibly delicious and well-balanced meal. Quiche = Girly Food? NAH. The thing that always makes me laugh about quiche is that a lot of men think of it as “girly” food. I mean really, how can food be girly? And who really cares? What matters about food is that it tastes good. Honestly, I’m really not sure how food that includes pie crust (I mean, would you turn down apple pie? ), cheese, and eggs should somehow only be consumed by women because it has a French name. Can we all just agree that that is silly? Especially when the quiche in question is this sausage and red pepper mini quiches. With Odom’s Tennessee Pride® Country Sausage, roasted red peppers, and smoked cheddar cheese, these quiches are substantial…but baked in a muffin pan, it’s miniature in stature so everyone gets their own baby quiche…no annoying attempts to cut a slice out of a pie-shaped quiche, because we all know how annoying that can be. My mom has bought Odom’s Tennessee Pride Country Sausage since I was a kid. Once, I bought another brand because the store where I was shopping didn’t have Tennessee Pride (tragic, I know). I should have made another stop (I could have picked some up at Walmart, which is where I got this), because I was sorely disappointed with the other brand. Odom’s Tennessee Pride Country Sausage always has the right balance of herbs and spices and it browns up perfectly. It’s just how sausage should taste to me. It’s perfect in this quiche with the smoked cheddar and roasted red pepper (which I roasted myself, but you can totally buy a jar). These sausage and red pepper mini quiches are so easy to make…the whole thing comes together in about 15 minutes, and then they’re baked and ready to eat in 25. You could even make them the night before and stick them in the oven when you’re ready to bake…and this sausage and red pepper quiche is delicious hot or at room temperature. 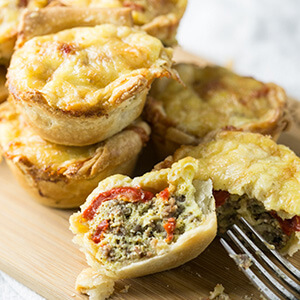 These sausage and red pepper mini quiches would be perfect on your Easter brunch table! Preheat a medium skillet over medium-high heat. Cook the sausage until browned. Roll the pie crust into a rectangle and cut into 8 equal pieces. I don't get too precious with this - just estimate how big you think it needs to be for 8 mini quiches. Press the 8 squares each into a cup of the muffin tin. Divide the sausage, chopped red peppers, and cheese among the 8 pastry crusts. Whisk the eggs, salt, and pepper in a bowl or large measuring cup. Divide the egg mixture evenly among the muffin cups. Bake for 25 minutes. Serve hot or at room temperature. To make your own roasted red peppers, heat a broiler to high with a rack 6-8 inches from the broiler. Cut the sides off of a large red pepper. Place the red pepper skin side up on a baking sheet. Place under the broiler and broil until the skin is blackened. Place in a bowl and cover with plastic wrap. Let stand for 15 minutes then peel off any blackened skin.